2016/06 – Pop Up Show! Jeni Hegsted is the founder and Executive Director of Emerge, Jeni worked in the arts for the past twelve years and was instrumental in bringing awareness to homelessness through art installations, volunteer artists, and special events. Jeni has received accolade for distinguished service including the 2014 Inlander Peirone Prize and the 2014 Mayor’s Arts Awards for excellence in arts education. Jennifer Drake is President of the Board of Emerge. She attended the University of Idaho and the University of St Andrews in Scotland, receiving her BS in Public Communication in 2003. After working in Los Angeles and Washington DC, she returned to Idaho to work as Media Director for Pita Pit USA. She is currently raising three children with her husband Benjamin. In her spare time, she is an artist and Chairwoman of the Arts Commission for the City of Coeur d’Alene. Keri Stark is the Vice President of the Emerge Board of Directors and Director of Community Impact, United Way of North Idaho. Keri earned a BA in Cultural Anthropology from the University of Idaho, and applies those skills to understand social behavior and trends in education, health, and economic mobility, specifically for low-moderate income households. Since moving to Coeur d’Alene 2012, she has been active in community development organizations including Leadership Coeur d’Alene, the Region 1 Homeless Coalition, Coeur d’Alene Vision 2030, the North Idaho Education Partnership, and the United Way ALICE Project. Jeanette Dunn is the Emerge Treasurer and the publisher of custom and marketing publications, both in print and online. She brings more than 25 years of corporate relationship building and fundraising experience with nonprofit organizations as well as experience with promotions for businesses and events. As a publisher, entrepreneur and creative director she brings a variety of personal experience in multi-media engagements, with knowledge of strategic communications and brand development. Tessa Jiliot is Secretary for the Board of Directors at Emerge. She moved to Idaho from Wisconsin to attend graduate school at the University of Idaho, where she graduated with a Master of Science in Conservation Social Sciences, as well as a Master of Public Administration. She works for Lewis-Clark State College as a Program Advisor and adjunct instructor. In addition to Emerge, Tessa serves as the Chair for the Coeur d’Alene Pedestrian and Bicycle Advisory Committee. Mark Rakes has been a director on the Emerge Board since its inception in 2015. Originally from El Paso, Texas, he moved with his family to Coeur d’Alene in 1985. He has worked in software engineering for the last 20 years. Mark is a founding board member of the Sorensen Magnet School of the Arts and Humanities PTO, which has raised over $500,000 in funds specifically to support an Arts and Humanities-focused school curriculum. He is also currently the Vice President of the Board of the Coeur d’Alene Education Partnership, an organization formed to support quality and excellence in Coeur d’Alene schools. He holds an AA Degree with an emphasis in Music Theory and Composition from North Idaho College, and a dual BS in Computer Science/Computer Information.. In his spare time, Mark still actively plays music, and hopes that through his involvement with Emerge he will someday learn to paint. Mia Giatti is an incoming 2018-2020 board member. A K-12 art teacher for the Plummer-Worley School District, Mia brings experience in program development, education, fundraising, and special events. Mia assists in the ongoing development and expansion of Emerge’s Ceramics program as it continues to grow through collaboration with students and instructors. In continuation with our goal of minimizing plastic waste, Mia creates ceramic wine cups for purchase during art walk. Originally from Portland, Maine, Mia moved to Coeur d’Alene with her husband in 2014. She received a BFA degree in Ceramics from the New Hampshire Institute of Art, as well as a K-12 Visual Art Education endorsement. We depend on support and sponsorships to help our community's budding artists emerge. Thank you from the bottom of our paint cans. Click here to donate. 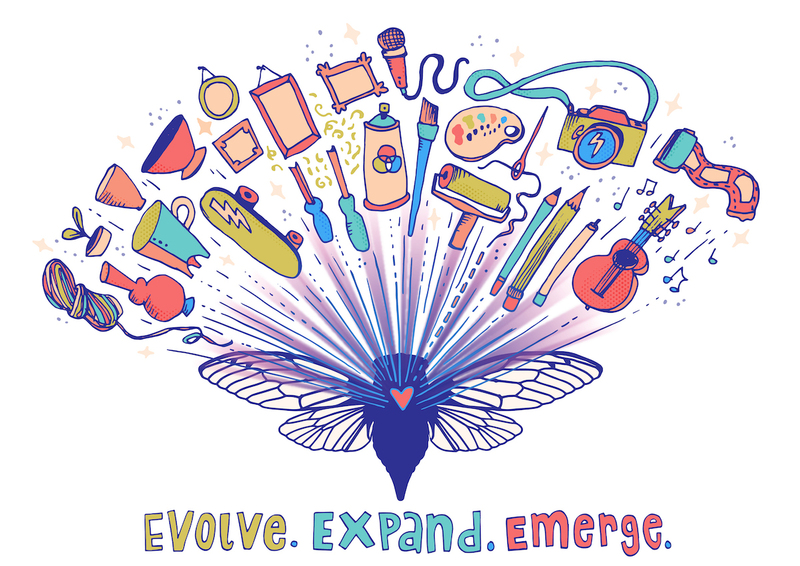 Mission Statement: Emerge is a collective art experience engaging all members of the community in a variety of high quality creative outlets, while offering a platform for emerging artists to cultivate their careers as professionals.